The Magnum is a popular creek boat from Riot's top WW team & offers superb value for money with fully adjustable outfitting at a great price. Available in 2 sizes to suit different sized paddlers. The Riot Magnum 72 & 80 have become legendary for handling some of the biggest features and steepest drops on the planet. It could be down to the sleek deck and complex rocker profile which prevents the bow resurfacing like a Polaris missile and thus it’s less tail happy and easily controllable when the going gets large. Then again perhaps it’s the way Riot shaped the tail and worked the volume behind the cockpit, keeping you from being pushed in into bad corners and prevents stern squirts. So, you will get exactly where you want to be in the first place. Riot takes the position of providing paddlers with thoughtfully designed, down-river tools to express themselves. You will not believe what your eyes will see. We offer a delivery service for the Riot Magnum to home and work addresses throughout England, Wales, Scotland, Northern Ireland & Ireland. 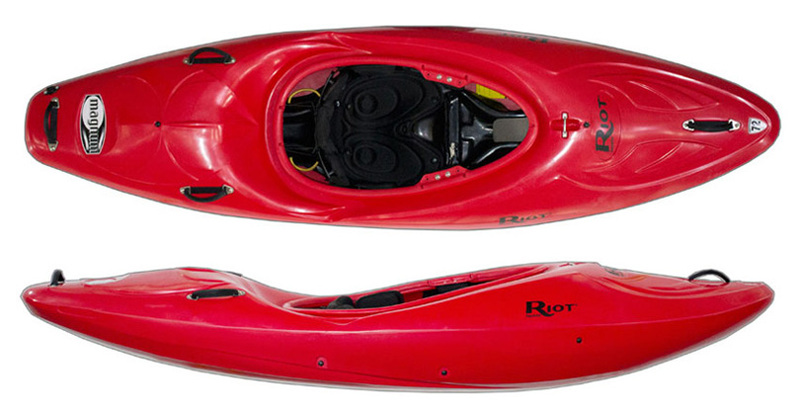 Buy a Riot Magnum online from our website and collect from our store in Newhaven, East Sussex or from any branch within the Canoe Shops Group. There is no cost associated with this*.